Working in a tradition that stretches from Thoreau to Rebecca Solnit, Miller offers nothing less than a new way of seeing the American past—and of understanding what it can offer us for the present . . . and the future. In conversation with Nathan Jandl and Laura Dassow Walls on Henry David Thoreau, hope and other ethics, anarchism, and an environmentalism for today. For Edge Effects. Interview here. Feb., 2018. In conversation with Kris Welch, for KPFA's The Talkies. Interview here. April, 2018. In conversation with Steve Paulson, for To the Best of Our Knowledge. Interview here. April, 2018. 5 Questions with Daegan Miller, Author of This Radical Land, City Lights. In conversation with Brian Edwards-Tiekert, for KPFA's Up Front. Interview here. June, 2018. 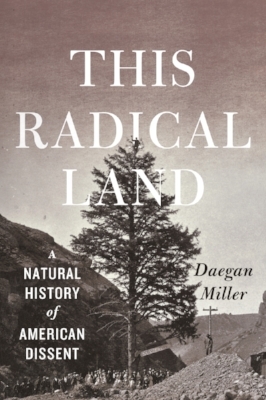 7 questions for Daegan Miller about This Radical Land: A Natural History of American Dissent, University of Chicago Press Blog. June, 2018. Through interpretive brilliance and gorgeously crafted prose, Daegan Miller's This Radical Land: A Natural History of Dissent rescues this sense of environmental awe from excessive skepticism.... One of the most elegant and insightful examples of environmental writing I've seen in many, many years. Miller crafts exquisite, lyrical sentences, and each act takes the reader on a journey that results in a deeper understanding of what wilderness has become, what it could have been, and what it might still be.... All told, Miller has produced a wonderful work, not just of environmental history, but also of nature writing in its highest form. Miller offers an engaging interplay of natural and political history, and demonstrates an eye for that single detail that can illuminate the whole damn diorama. Nuanced, provocative and immensely learned. Miller’s study is not just a historical counternarrative, then: It’s also a way of thinking about the contradictions of modern environmentalism, of asking whom the movement serves, what ideas are allowed, and who is marginalized. Miller’s debut views landscape...as both a witness to and a participant in American history, especially in stories of resistance.... The result is a text that succeeds not only in arguing its theories and presenting an elegant narrative but in reminding us just how easily certain people and places can be erased from our popular histories.... Fans of Derrick Jensen, Howard Zinn, and Rebecca Solnit will appreciate Miller’s fascinating and unexpected perspective on American history. A debut book that ranges across disciplines and decades to connect the natural environment—especially long-lived trees—to a scathing critique of American-style capitalism. Alternating abstract theory with impressive research, both bolstered by extensive sources . . . the author builds his case about understanding American history by examining destruction of the environment through essays grounded in the 19th century…. He offers an eclectic education often marked by soaring prose. Inventive. . . . A creative linking of landscape and radicalism. Drawing on superb scholarly detective work, This Radical Land tells fascinating stories about the history of our ties to the land that give us an alternative to viewing natural spaces as either a resource to exploit or a wilderness museum for the privileged. Miller peels back the history to reveal that, however ignored, Americans have always resisted the exploitation of nature. Perhaps his more nuanced environmental history will inspire those today who, continuing the mute protest of the witness tree, would pull the planet back from the brink of death. Daegan Miller rekindles a legacy of environmental dissent. The ideas and landscapes of nineteenth-century “countermoderns” are signposts, still legible, to alternative futures. This book bears witness like a burning bush.